The Judges have made their decision! 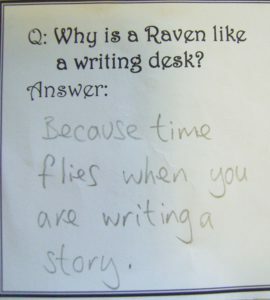 In equal nonsensical fashion we also ran a riddle competition, inviting our visitors to answer the age old question “Why is a Raven like a Writing Desk?” Many of you had a good go and we had some fabulous answers which will be published in the Ragged Times here on this site in a couple of weeks, along with the other articles and illustrations. The judges decided that this answer not only was very clever, but had just enough nonsense in it to perfectly capture the theme of the day and to do Lewis Carroll proud! Well done and congratulations to Cora who will shortly be receiving her prize of a Ragged School dip pen to carry on using her great imagination! We hope that everyone who attended our holiday activites this May half term enjoyed themselves and will be able to join us again over the Summer Holidays for even more creative fun! Comments Off on And the Winner is….